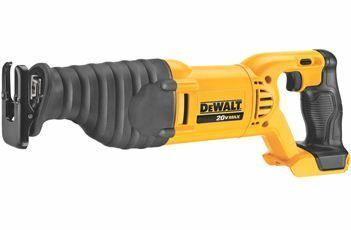 DEWALT’s DCK491L2 20-volt max lithium-ion 3.0 Ah four-tool combo kit includes a premium hammer drill, a circular saw, a reciprocating saw, and a work light—a well-rounded arsenal of high-performance power tools that help everyone from carpenters and remodelers to electricians and contractors work their way through a variety of applications. Meanwhile, the circular saw’s powerful motor (offering 460 max watts out) and ergonomic profile (with lightweight magnesium shoe and optimized handle design) are ideal for professionals tasked with framing, cross cutting, ripping, bevel cutting and plunge cutting. 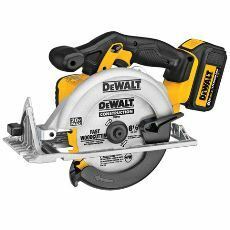 Delivering 3,700 RPM, this saw is 10 percent more powerful than previous DEWALT 6.5-inch cordless circular saws—and combined with its accompanying 3.0 Ah lithium-ion battery, it provides up to 57 percent more runtime compared with other leading 18-volt lithium-ion tools. Its bevel capacity of 0-50 degrees lends itself well to a variety of applications, and a 6.5-inch thin kerf carbide tooth blade provides users with the ability to cut completely through two-by framing lumber at a 45-degree bevel angle. 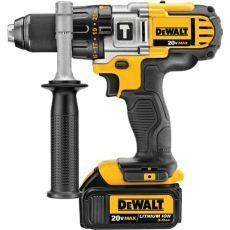 DEWALT-designed electronics have been built into all of these tools’ switches to provide maximum life by helping to protect them from overheating, overloading, and deep discharge during use. 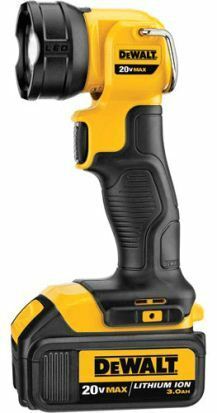 The max 20-volt’s lithium-ion batteries provide up to 35 percent more runtime than existing 18-volt max lithium-ion battery technology, and the included Energy Star-qualified charger has dual voltage capabilities and it is compatible with both 12-volt max and 20-volt max DEWALT lithium-ion batteries. The tools’ slim handles fit easily into users’ hands, increasing the level of comfort during the course of long jobs, and the bright built-in LED work lights above the triggers have a 20-second delay that improves visibility in dimly lit spaces. One DEWALT DCK491L2 20-volt max lithium-ion 3.0 Ah four-tool combo kit, including one DCD985 premium hammer drill, one DCS393 6 1/2″ circular saw, one DCS381 reciprocating saw, one DCL040 LED work light, two 20-volt max 3.0 Ah lithium ion batteries, one 12-volt max/20-volt max lithium-ion battery charger, one belt hook, one 360-degree side handle, and one contractor bag.